(b)(2)(e) The exhaust hood shall be fitted with a wet chemical fire extinguishing system. 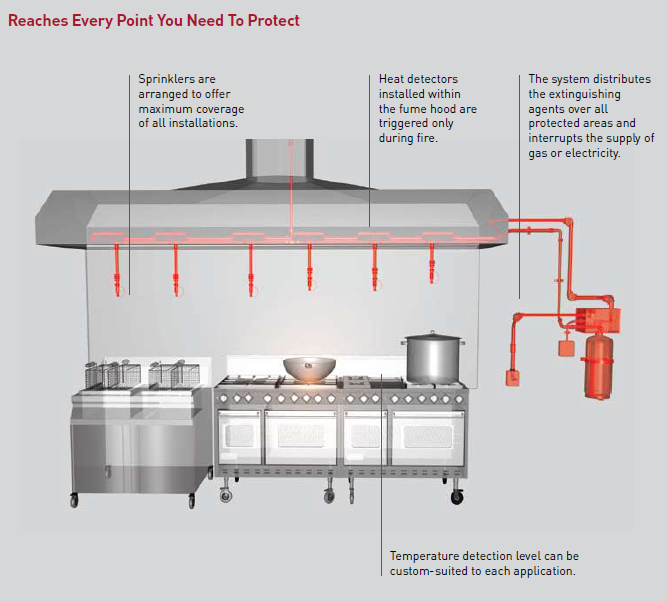 Our WCK automatic fire detection and suppression system caters for the needs of both small and large kitchens—from small businesses to large commercial and industrial kitchens such as those in hotels, restaurants, and public institutions. Custom designing, modelling, testing, and manufacturing of fire suppression systems to meet customers’ diverse requirements all under one roof. Liquid potassium phosphate is used to extinguish grease and cooking oil fires. On contact with the oil, the liquid turns into foam, preventing oxygen from reaching the fire and cooling the area. This agent is safe to use and does not affect kitchen stainless steel surfaces. The system distributes the extinguishing agent over all protected areas, while simultaneously interrupting the supply of gas or electricity to the area of the fire. The system can be operated manually or automatically. WCK Systems is offered in various sizes – 6L, 9L, 16L, 20L and 26L with chaining capability – unlimited flow points. The WCK kitchen fire suppression systems are UL 300 listed and CE marked. The systems designed to meet NFPA 17A and NFPA 96 requirements.